and self-discovery in a loving and structured environment. We offer morning classes based on the Montessori method developed by Dr. Maria Montessori. This method involves active learning by children through a graduated system of development. 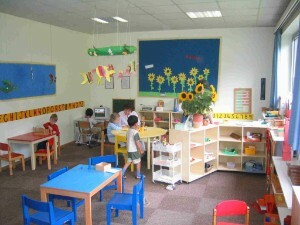 The children are offered many varied activities to choose from. These activities are structured in such a way that they become more challenging as the child's ability increases. Individual demonstrations by teachers allow each child to proceed at his or her own pace. The staff is comprised of three teachers and temporarily one teacher 's aide. With a maximum enrollment of 22 students, this permits a high degree of individual attention to each child's needs. 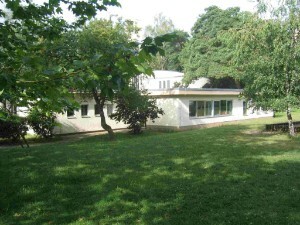 Proximity of the school to the Grunewald forest allows the children frequent nature walks and lessons on the seasons, weather and wildlife, as well as almost daily outdoor activities with fresh air in a natural environment. A modern, fully equipped playground is also located adjacent to the school. Gardening, sand and water play is offered in the school courtyard. Opening Hours: 8:00 a.m. - 16:00 p.m. All classes are in English. We look forward to working with your children!